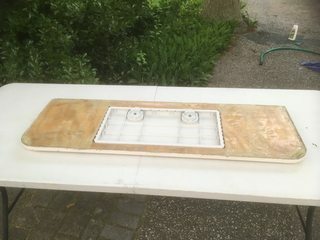 Removed rusty fridge that I was never going to use. My brother had some left over mahogany. Made a door frame and added a plexiglass door. There is a floor in there made of pvc board. 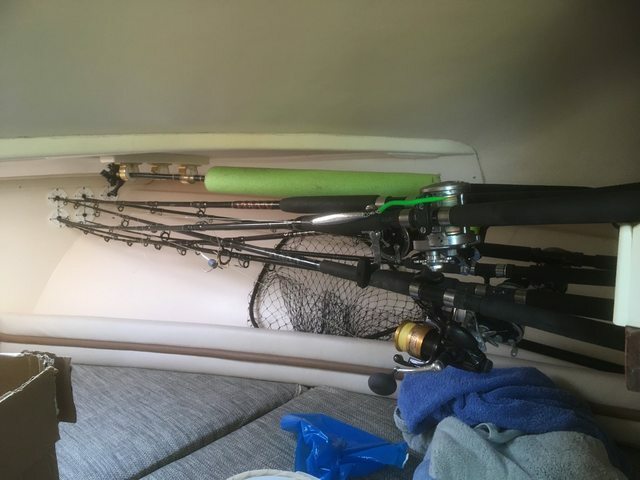 Very disappointed with the OE rod storage in the cabin. 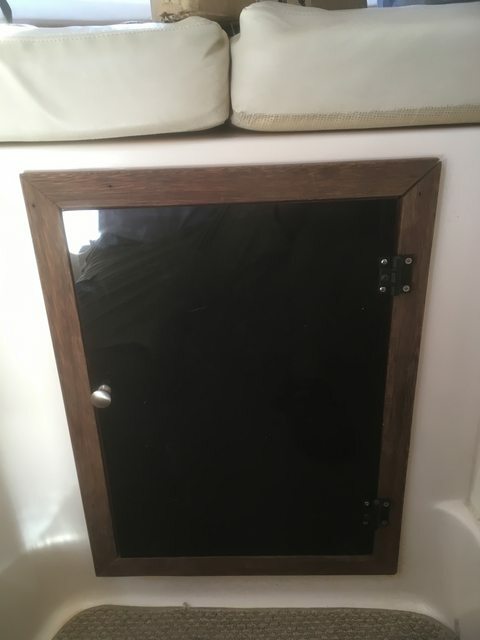 Put some rod grommets in the fwd bulkhead to accommodate 7 ft rods and added a pice of mahogany with buttholes (hehehe buttholes) under the shelf. 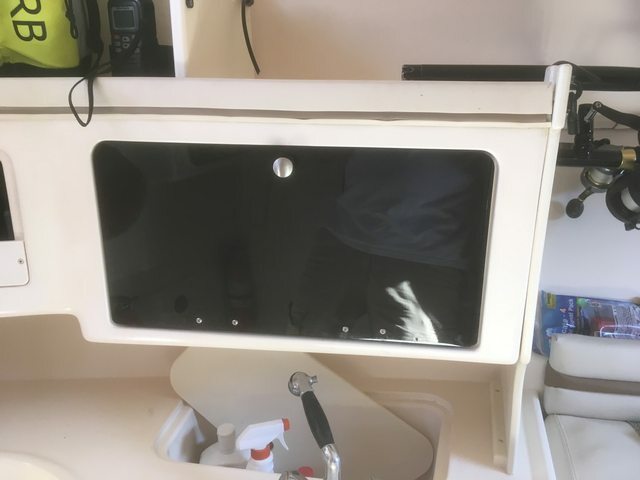 Added a few grommets to the port side in the fwd bulkhead and in the wall to the microwave compartment. Already need more.... Will have to add a wall inside anchor locker if I add more up there. also in pic, my sister-in law re-covered the cushions. 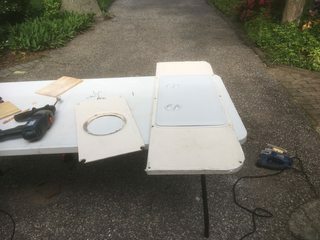 removed microwave that I'll never use and added a plexiglass door. I'd like to remove the faucet from the kitchen sink. Don't need 3 sinks. Seems like a real PIA to remove. I need to do something with my cabin sink faucet. The plastic chrome is turning green from salt air exposure. It was accidental turned on moving stuff in and out, off the cushion. I powered up my fresh water pump to rinse off with rear shower after swimming in the GOM, had low pressure and just figured it to be something up with the pump, the only one I haven't replaced. Come to find out my sink was on and running on the cushions and into the floor. Either do away with it and cap off the line or find a new replacement and just be more careful. It will clean up nice. my faucet was pretty green. The shower one too. After giving up on removing it, my brother polished it. As I've said in other threads, I hate that the aft deck cover has to be sealed. It really needs to allow easy access.The 6" port is insufficient. Left unsealed, salt water drips onto oil pumps, washdown & live well pumps and wiring. Thought about different ways to seal with gaskets or deflect water towards the center so it doesn't drip on important stuff. Decided to add a big deck hatch. My brother says it'll leak but... Worse case, if the hatch drips, it will be in the center and not effecting things. 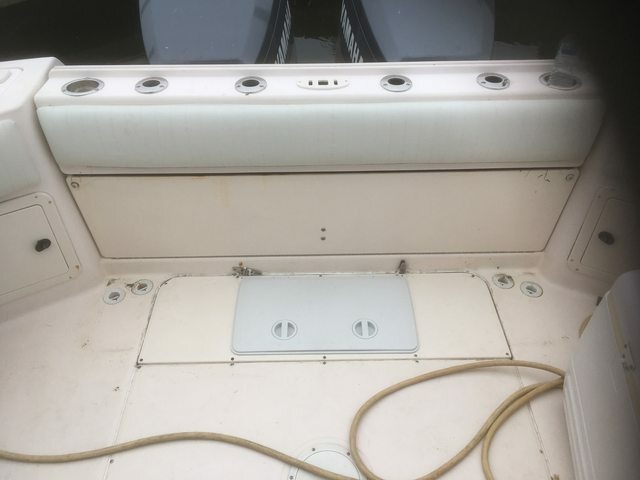 Used the oppurtunity and re-cored the aft deck cover and then added a 13 x 23 Tempress hatch. I'll update when its mounted and let you know how I like it. I had ordered a plastic tub for it but it turns out it is not a drop-in tub, it has to be screwed in under the hatch frame. So I'm returning the tub. 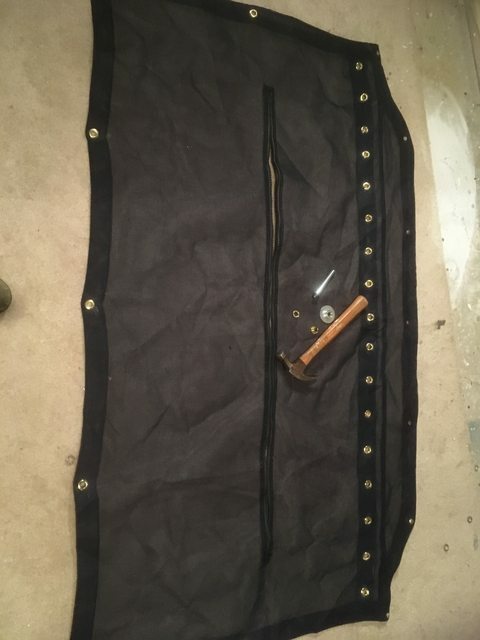 Replaced grommets and zipper on hardtop life-jacket net. Also replaced 2 zippers in the hardtop enclosure. Might get another year or 2 out of it. 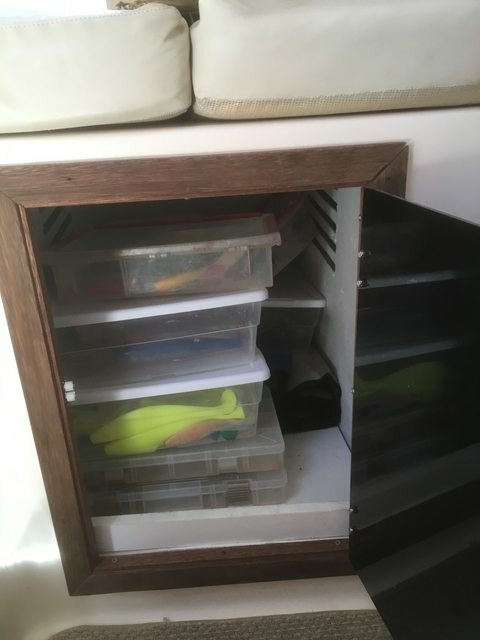 I had a 265 for two years and noted those stern corner hatches with the lift out basins LEAK. 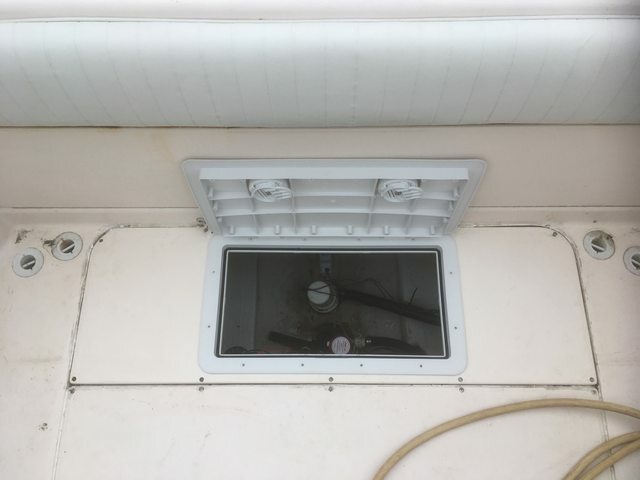 Rain water and saltwater find their way under the lips of the lift outs and it drains into the bilge. Water on your batteries, water in your bilge - ugh! Have you seen this? On mine, it was very noticeable. No amount of gasket material would fix it. So, I installed a round 6" twist out Beckson hatch on each so I could reach the battery switch, etc. and sealed the lift outs with Dolphinite. Dolphinite is marine bedding compound. It is a waxy pliable material that seals out water and is still removable by hand (can get from West Marine BTW). Kinda like the texture (and color) of peanut butter and it never dries - just gets a skin on the outside. Anyway, doing this made those stern areas arid dry. Another cheaper solution is to duct tape the edges of the lift outs but that looks like the boat is a Bayliner! 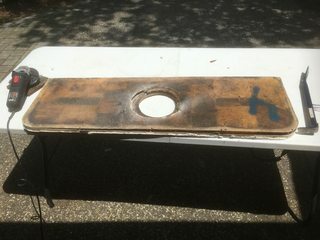 here is new hatch in position....not sealed & screwed yet... need to add a few inches to the bilge pump hose before buttoning up. Good job - Looks great! Glad that you also fixed the inside (bottom) of that rear deck plate. Looks much better now. Any idea WHY Grady-White used all those horrible square pieces of wood under there? Those squares are normal boat building technique. Everybody does it in decks and hatch lids. When they make a deck liner or hatch, they have a mold, they spray in release, gelcoat, resin, chopped strand. Then they press in the squares. They are small enough that they get complete contact with the chopped strand and resin. Then they cover with resin & chopped strand. If they used one large piece, it would not lay flat and there would be air gaps. Another added benefit of wood squares is that water from screw holes can only travel through one square, whereas it would otherwise travel the length of a plywood sheet. The problem I see with the Grady hatch is that they ran the wood all the way from edge to edge. That means there was only a thin connection of the top & bottom glass at the edges. Over time it separated and water got in.Also, the screws went through wood. A better (more time consuming and expensive) way is to leave a 1 or 2 inch gap around the edges and build up thick glass there. Then the edge bond is thick and the screws go through glass. I left a slight gap and filled with high density filler. I didn't make a wide glass edge because, like Grady, I was in a hurry... I did go over the chopped strand with glass cloth and ran it into the filler. Thank you for explaining the wood square thing. Still looks lousy IMHO but I guess I understand why they did this at the time. My 330 Express has none of that (model year 2006). 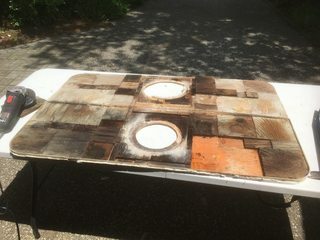 The inside of my deck hatches are solid fiberglass. Good luck with the rest of your upgrades. p.s. I see your 265 is in the Manasquan Inlet. During my college years, I worked as a Deckhand on Bob Bogan's "Gambler" docked next to the USCG station. I have a lot of good memories fishing on that boat. Me and the other deckhand trained Bobby Junior who now runs the new Gambler. I was on the old one with Bob Sr. at the time (late 1970's) smacking the bluefish at the Mud Hole and all over. Not sure about your hatches. They usually core decks and hatches or the weight would be way too much. Even when they use Coosa they use it in squares. Wow! You must be really really really good to have a professional Captain follow you around. Its been a running joke for years. We always get out early, before the party boats, so when they show up we say they are following us. Oh, by the way, my brother is a professional Captain. your fridge replacement looks awesome ! so does the microwave area. i got rid of those and did something also. i was able to get the faucet off my kitchen sink no prob. i will take a look at it ( i saved it) i may be able to tell you how. Kept out tuna blood and clam juice. Can get both my elbows in there. Have not tripped over it. An update to this project... I used a grommet kit from Harbor Freight...it LOOKED like brass....they were completely rusted by the end of the season. Got a set at Home Depot, tested with a magnet...BRASS!...re-did the grommets on a 60 degree day in February...DONE! Soak in CLR and buff it out. You'll get all the lime, rust and green out. Hey Skunk. Nice mods to your 265. 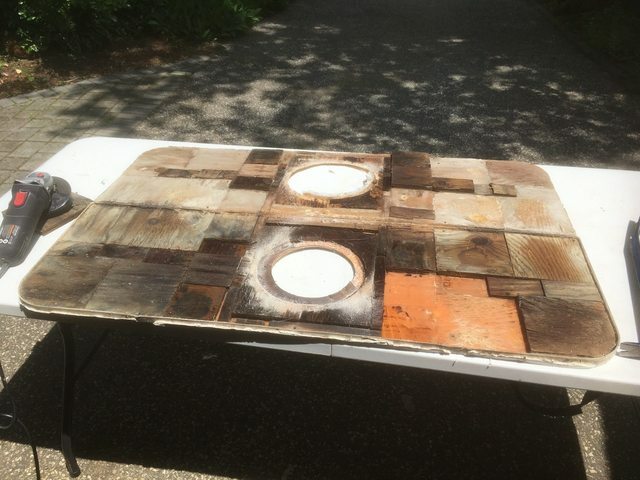 The stern hatch cover is a good solution to the round cover. 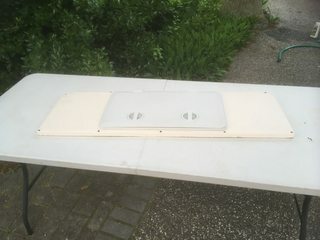 How flush is the hatch and is it strong enough for someone to stand on? About a 1/4 inch. Haven't tripped over it. When big cooler is on it its not tippy. Definitely holds weigh of people standing directly on it no problem. Does collect a bit of clam around the gasket but doesn't let it into the bilge. I'm totally thumbs up on it and my skeptical brother is convinced its a worthwhile improvement.